Through blogging, I have been able to meet some of the most amazing people and experience the coolest things. 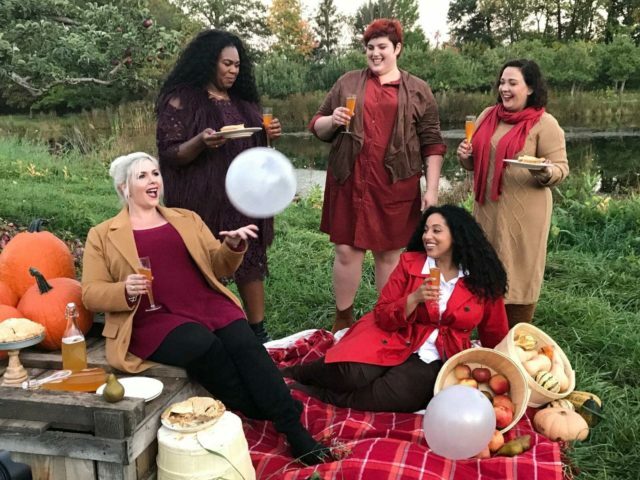 Both combined about a month ago when Full Beauty invited me and several other bloggers and models to be part of a fall fashion campaign. 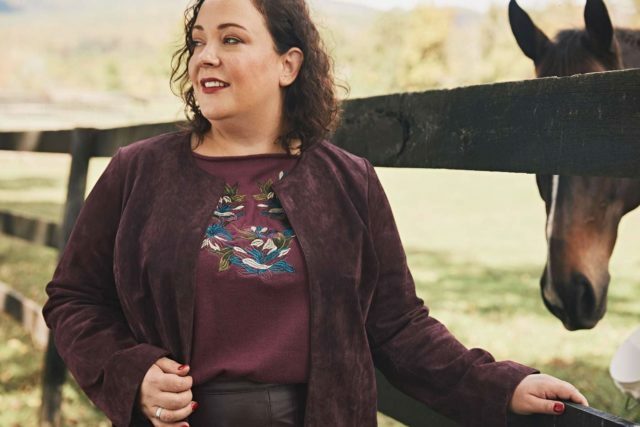 Full Beauty is a marketplace of over 300 fashion brands in sizes 12+. This campaign featured the brands Ellos, Roaman's, Woman Within, and Jessica London with each of us influencers representing one of them. I was chosen to represent Jessica London. 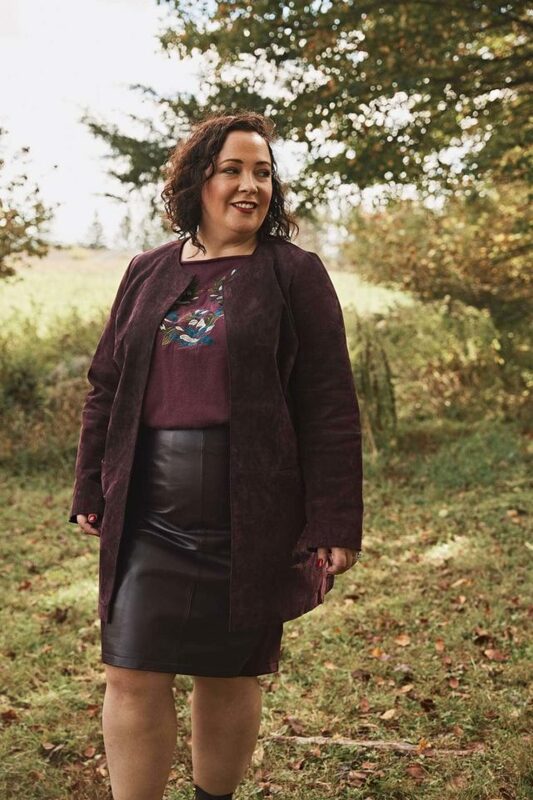 I'm wearing the Jessica London Open Front Suede Topper (16), Leather and Ponte Knit Skirt (16), Jacquard Three-Quarter Sleeve Boatneck Tunic (14/16), and the booties I'm wearing don't seem to be online but these are similar. This was the first shoot of the day. The concept was that I was the lady of the manor, the owner of the estate and all the horses. It was hard to look proud and elegant instead of cheesy smiling like I usually am but I tried to smize! I've never considered myself a model; while I do outfit posts I'm not terribly comfortable in front of the camera. Having Karl as my photographer is what puts me at ease, he knows me, knows my personality and my best angles. Also that he hands me the memory card after shoots to have full control over what images see the light of day makes things easier. This was an opportunity where I was putting it all in another's hands – what I was wearing, where were shooting, how I would look, and which images would make the cut. I'm wearing the Jessica London Cable Knit Sweater Dress (14/16), Roderick Boot by Comfortview, and Extra Long Scarf. This was the last shoot of the day where we were celebrating the end of a great day with apple pie and cider from the apple orchard. From left to right it's blogger Dani Sauter, model and chef Carine Calixte, model Shay Neary, model and blogger Alex LaRosa, and yours truly. Full Beauty brought me (and fellow DC fashion blogger Dani) up to New York the day before the shoot and put us up in an adorable Airbnb in Brooklyn. Dani and I requested earlier train tickets so we could spend the whole day beforehand enjoying NYC. We even booked a photographer for some outfit shots in the afternoon (you can see the results in this post and this post). The day was rainy and long, but we had a great time. 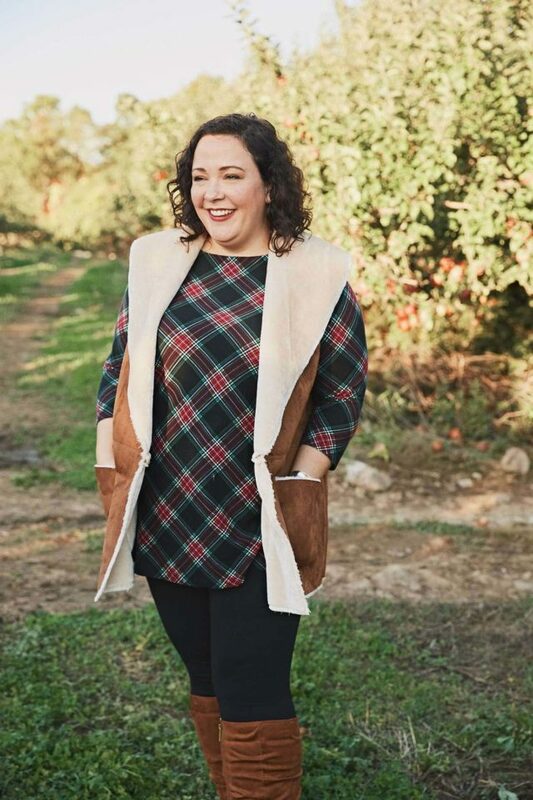 I'm wearing the Jessica London Faux Shearling Vest (14/16), Refined Boatneck Tunic (14/16), Leggings by Ellos, and Roderick Boot by Comfortview. 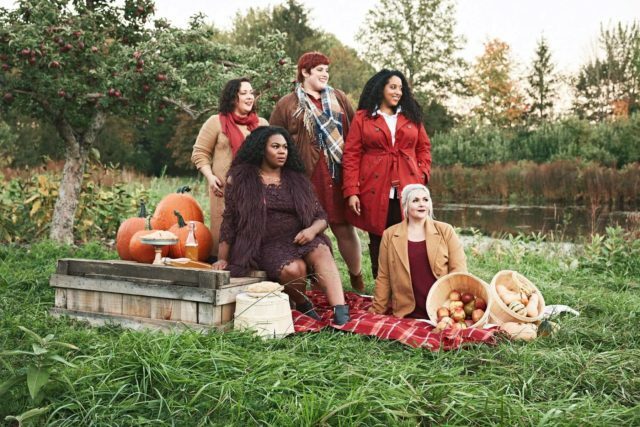 For this shoot, we were at an apple orchard and the vibe was relaxed and fun. It actually was the most fun shoot of the entire day! The next day started off rough, I was feeling feverish, had cramps, cold sweats, and was nervous about the day. The other influencers in the campaign all had previous experience, and all were a decade younger. At one point during the first shoot, I was feeling faint. I ended up feeling better after some shade, water, and something other than caffeine in my belly. And the day ended up being amazing and it was because of the people. The other women in the shoot were so friendly and fun. The producer, photographers, and videographers were experts but also really helped put me at ease. And it was so cool to meet some of the women behind Full Beauty, people I knew from the occasional email or DM now had faces and fabulous personalities. It makes me love a brand even more when I find out the people behind it are so wonderful. It was two long days but two exhilarating ones. I totally went out of my comfort zone and am so glad I did. Thank you Full Beauty for such an awesome opportunity! Love the looks!! Such amazing photos too!! Allie, your posts always hit home with me the most when you are not afraid to “let it all hang out”, like this bit of emotional roller coaster you experienced participating in this event. It makes you real, likable (no wonder your blogging has been such a long term success), and relatable. The internet is full of fake people, with fake lives and fake personalities. You are a shining star⭐️, my friend. Wow thank you so much Melissa! How fabulous that these opportunities are coming your way, Allie!!! You look incredible in all of these photos. I have to laugh when you talk about this, because I always think that others will do a way better job than what I’m doing, so i don’t mind when there are other photographers!! Looking good! I love Full Beauty.You can really get some good deals and quality pieces once you become familiar with their different brands. Some I like more than others and I’ve also discovered a couple of brands that I absolutely love such as Ellos and Ulla Popken. 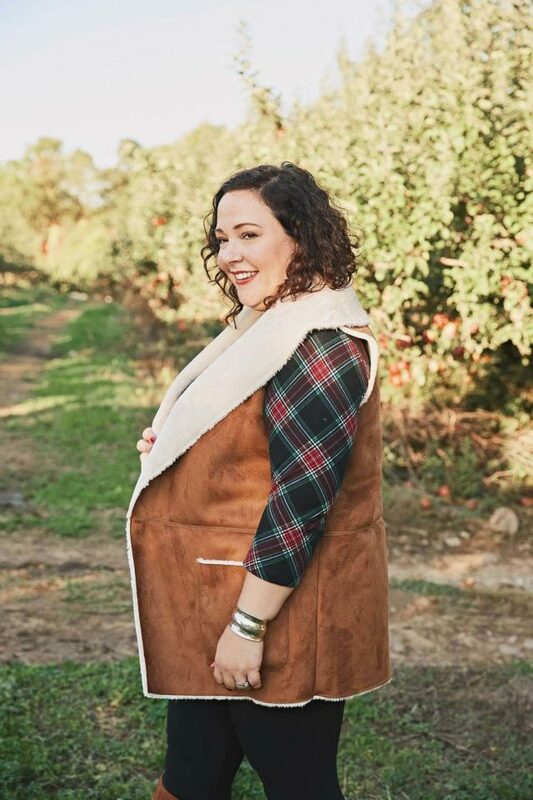 I’m waiting for a dress and quilted and knit vest from FB right now. You all look like naturals! Thanks Michelle! I am a fan too. I’ll admit I’ve never taken a look at Jessica London but was very impressed by the quality and fit of the pieces. The leather and ponte skirt I’m wearing I took home with me, I think it’s pretty phenomenal (didn’t have much room in my luggage for anything else). Ellos has become a favorite, spoiler alert but I’ll have a few looks from them in the near future on the blog! I will be ordering the sweater dress and the leather/ponte skirt. I would also love that red trenchcoat! Who are the other bloggers? I cannot believe I didn’t include them! I updated with links to all of their sites or social media. Dani Sauter, Shay Neary, Carine Calixte, and Alex LaRosa. Alex and Dani have blogs, the other two are primarily models. Looks like a great shoot. Scary to put yourself out there, but you looked great! Oooooh I love that plaid tunic! It’s super cute and comes in a real variety of colors and prints!